There are so many ways to organize and store paperwork. The perfect system has to fit your lifestyle as well as the space it is intended to fill. If you are limited on space, but want easy access to your files, use a storage trunk and ottoman with storage. These items can serve as storage as well as a place to sit. They “hide” what you may not want to look at on a daily basis. Maybe your looking for something on your desktop to house your “action files”? This is a clever idea – a dish drying rack. 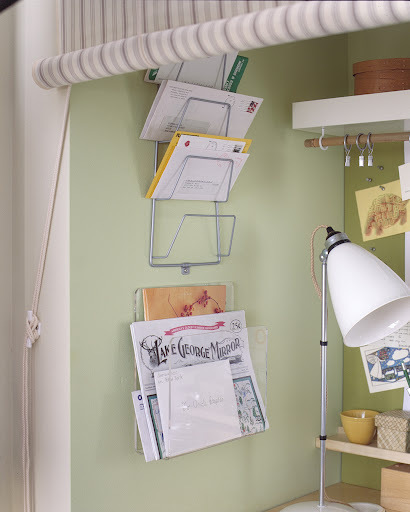 If you are really tight on space and like to “see” your files, use a wall mounted file holder such as the one below. These wall mounts can also be used to hold pot and pan lids! If you are constantly on the “GO” and need something that is easy to tote around, check out the Utility Tote by Thirty-One. Just insert the Open-Top File Box found at The Container Store to hang your files. Or use the Lilly Pulitzer’s Collapsible Storage Bins found at See Jane Work. They have handles for easy transport and come in designer prints. What is your favorite way to organize and store files? Next post: Let It All Hang Out This Holiday Season – “Good Enough IS the New Perfect”!